George Widman always presents a room that makes you wonder why he hasn't taken over the world. The answer, of course, is probably lazy, disorganized show reporters. Take me, for example. On Friday afternoon, I promised that I'd come back to this room to get a printed equipment list. On Monday morning, at 5am, in the Hyatt parking lot, I nearly got tackled by his wife. "You never came back!" I'd had no coffee, I was rushing to get a plane, and I was (understandably, I hope) a complete mess. I promised her I'd email her for an equipment list. That, friends, was a week ago. Can you guess what I haven't done yet? Words don't even begin to cover the shame. I’ll try to remember what was in the room from my blurry pictures [editors note: we used mine instead]. Mistakes are mine, mine alone, and hereby offered up for some well-deserved ridicule. 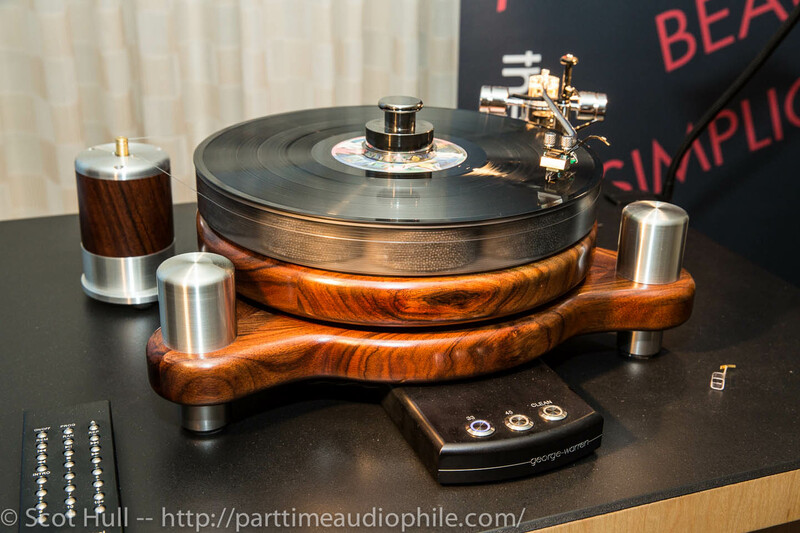 Starting at the top of the chain, we have a Soundsmith Hyperion cartridge ($7,500) riding in a Mørch DP-8 tonearm with a red-dot, 9″ arm wand ($4,995). The Mørch DP-8, if you haven’t heard it, is the reigning champ of digging bass out of grooves. The surprising thing about it is how it still manages to sound as light on its feet as a styrofoam unipivot. 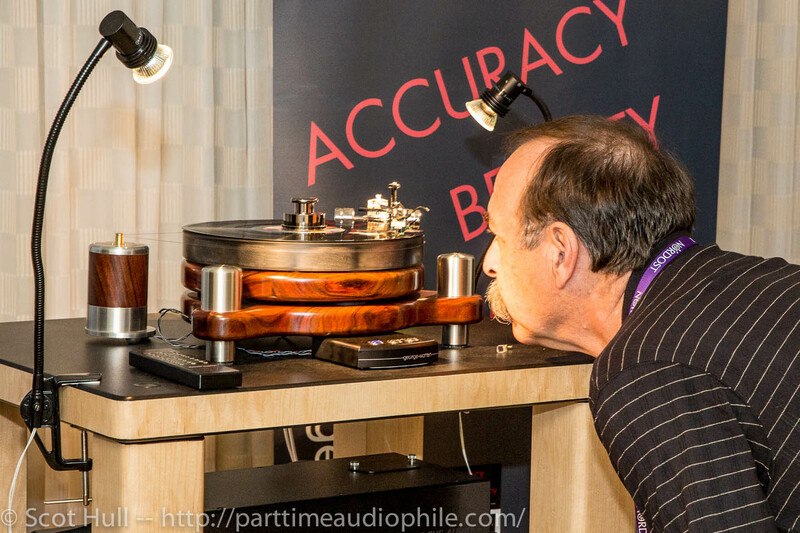 Mr. Widman’s affinity for Mørch tonearms is one of the reasons that his room is one of my first stops at RMAF. 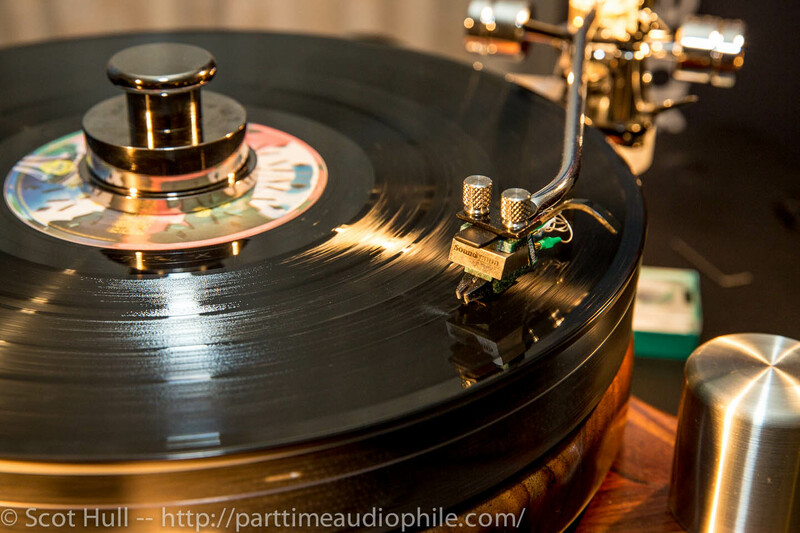 Moving down the chain, you’ll be unsurprised to know that the George Warren turntable was spinning records. Starting at $4200 ($4,850 as shown) for the painted MDF jobbies, this is one of the leading lights of bespoke kit. George Widman will work with you to mill the plinth out of exactly the right wood for your purposes. All of his turntables, though, share the mass-loaded acrylic platter and unexpectedly sane DC motor. DC motors have a well deserved reputation for smoothness, but they also have a not-completely-undeserved reputation for being somewhat rhythmically lacking. The George Warren turntable seems to use its combination of heavy platter and sensible motor control to sidestep the latter issue. I’ve never heard any timing abnormalities coming from one of these decks. 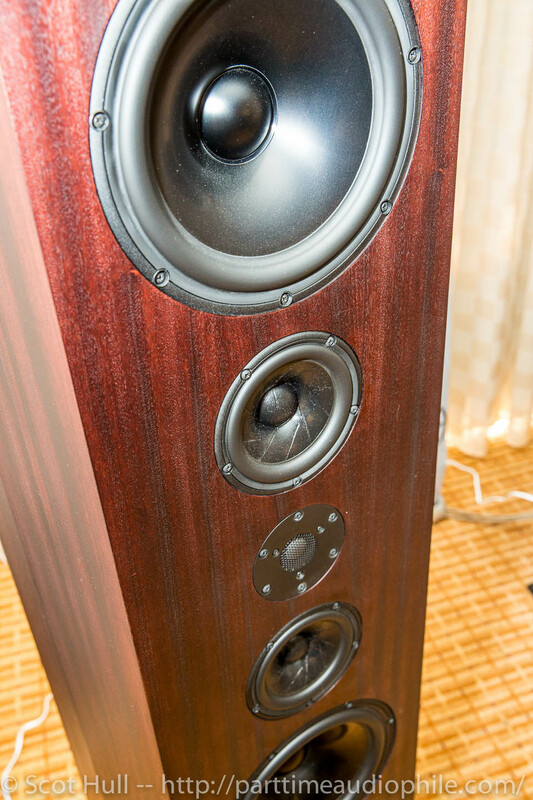 They sound just as solid as they look. As for the rest of the system… it gets a little fuzzier. If I’m in the ballpark, the speakers in use were the new Highland H2 ($11,500/pair) from Tyler Acoustics. 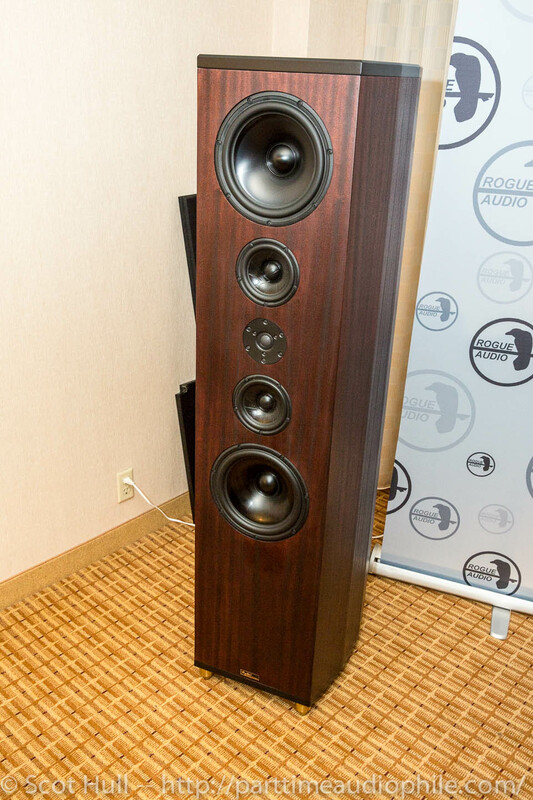 These are five feet tall, two hundred pounds, and 90db sensitive. They have a 4ohm nominal impedance, and a claimed response down to 22hz. 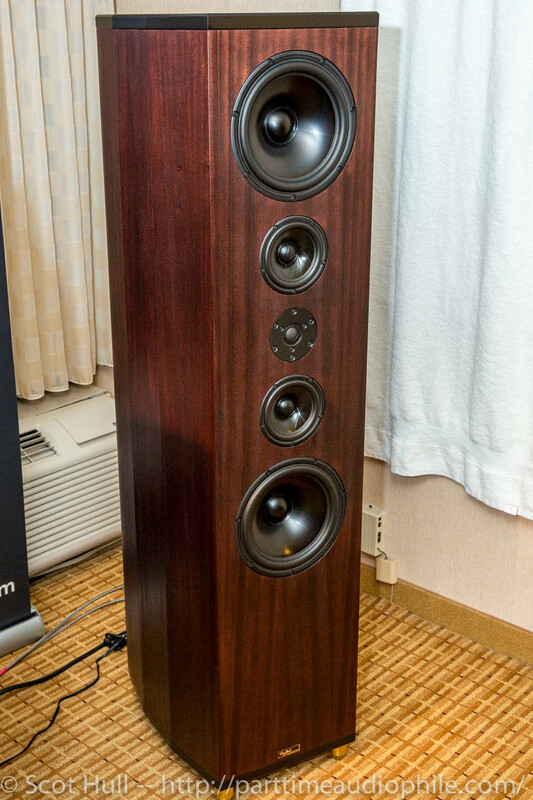 The initial impressions from this speaker matched what I’ve heard from other Tyler Acoustic products: they seem very, very precise. 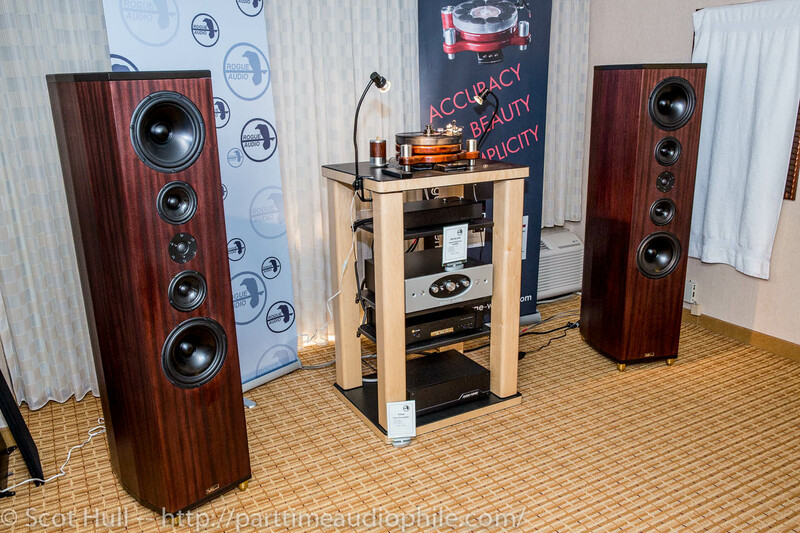 The electronics in use were Rogue Audio‘s Pharaoh integrated amp, a $3500 hybrid tube/Class-D design that pumped 350 mellow watts per channel into the Tyler speakers. 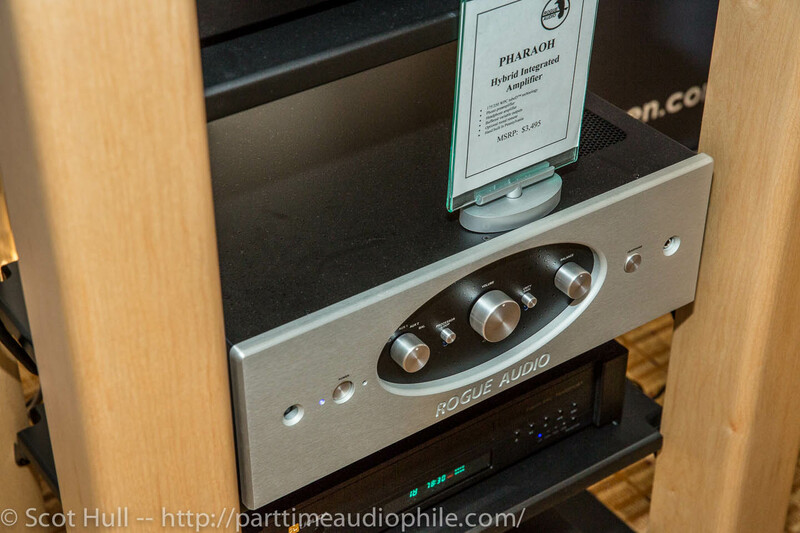 Phono preamplification was Rogue’s $995 Triton.